San Felipe, Baja, Mexico has paid its dues to a fraternity whose voice galloped around the world until its momentum was poleaxed by the Great Recession of '08. There is still property for sale, but its is more in line with flopping homes, rather than flipping them. The financial crises, despite President's Calderon's valient efforts, has affected Mexico even more than the USA. The year 2013 began with optimism and economic growth, but then the PRI's dramatic reforms were proposed and the fiscal landscape took a downswing. The new Value Added Tax reined in the construction industry's slow progress and by the close of 2013, analysts and various business sectors were doubtful about 2014's prognosis. But that may be a good thing. Recessionary periods offer real estate bargains. Prices have dropped dramatically and offer exceptional opportunities and value for affordable rental, vacation or retirement investments. Whether you are interested in land development, building condominiums or hotels, looking for investment property or you want to live here permanently or part-time and take a lease or fideicomiso, owning property in San Felipe may be the answer to any one of the following questions. Looking for a warm place to spend those snowy winter months? Want a change of pace for your retirement years? Feeling the need to settle into a custom-designed home with view of the Sea of Cortez but can't afford water-view prices in your area? Tired of the rain and want a place with a near year-round sunny climate and sandy beaches? Looking for a wise investment in the real estate environment? San Felipe is located in northern Baja, Mexico, just a few hours south of the Mexicali border. Hosting a variety of activities that range from sport fishing to desert excursions, the area is fast-becoming a tourist mecca. Geologically the area is spectacular. Beautiful beaches, desert floor and a 10,000 foot high mountain range surround the town. 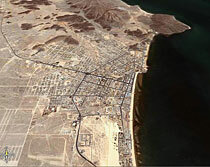 San Felipe is located in one of the two sunniest places on the planet (the west coast of Chile is the other). It is often possible to sit on your deck and enjoy a view of snow-capped mountains while you sip a cool drink in 80 degree temperatures. In this regard, San Felipe is one of only a few places that offers such diverse natural features in a single setting. Add to this the ammenities of a fast-developing resort town and you have a near perfect environment for retirement or vacationing. Fondo Nacional de Fomento Al Turismo (FONATUR) is a government agency responsible for the development of tourism. Along with the Secretary of Tourism (SECTUR), they have targeted the Baja peninsula and the communities along the Sea of Cortez for the development of the Escalera Nautica, or Nautical Staircase. Their aim is to "promote the accelerated growth of nautical tourism" in the region. This means new resort facilities, including better coastal roads and modern marinas. For thousands of tourists every year, San Felipe is the gateway to the Sea of Cortez. Each season, the visiting traffic increases. Recently the Mexican government has pledged to put millions of dollars into the development of San Felipe's infrastructure, including the airport, marina, a four lane highway from the U.S., and fiber optic telecommunications. These improvements will obviousy make it more attractive for tourists and for local tourist-related businesses. More hotels, stores, recreational facilities and services are coming to San Felipe. The value and exclusivity of property in the San Felipe and outlying areas can only increase. Whether it's a commercial or residential interest, Blueroadrunner can be of help in finding the property that best suits your needs and goals. And remember, when involving yourself in any real estate deal in Mexico, a notary should be consulted. Also, when contracting for house construction, be aware of Mexican Labor Laws. If you decide to deal with online companies for your sales, rentals, timeshares, etc, take a minute to check with the Better Business Bureau's URL search tool. Just put the company's internet address in the URL window at the top of the page.